Ola Mini vs. Ola Prime? How much does an Ola Cab cost? Which Ola Cab service is right for me? OlaFareFinder calculates the cost of your Ola ride in over 100 supported cities. Simply enter your pickup and dropoff locations to get the price estimate of a variety of Ola Cab services (Ola Mini, Ola Sedan, Ola Prime, etc) available in your area. Check Ola peak time surcharge pricing! OlaFareFinder will even warn you if peak time pricing is currently enacted in your location. 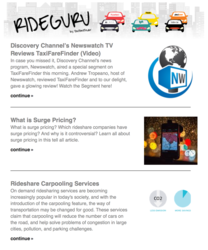 Keep up to date on the latest taxi and rideshare news by signing up for the RideGuru e-newsletter! Email is required. Enter a valid email address. We will never give your information away, and you can unsubscribe any time. OlaCabs, or more commonly referred to as Ola, is an online, on-demand car service based in Bangalore, India. Ola provides riders with a variety of car services, ranging from their ultra-affordable Ola Micro service to their luxury business class option, Ola Prime. Ola cabs are requested and booked through the Ola smartphone application via the touch of a button. Once a customer books their Ola car, they will have the option to pay via cash or with Ola money. Ola money is a cashless form of payment within the app, which allows a customer to buy Ola credit (via their credit or debit card) to use towards Ola rides. Ola cab prices are very reasonable but occasionally when Ola cabs are in high demand the company may enact peak time surcharge pricing. Peak time pricing could double or even triple your fare depending on the surge amount. Luckily, Ola will always warn you if peak time pricing is in effect before you decide to book one of their cars. Ola Cabs is currently available in over 100 cities across India. What cities does Ola support? What rideshare services does Ola offer? Ola’s newest and cheapest service. When you select an Ola Micro, a compact car with seating for up to 3 people will pick you up. Another low cost service, though slightly more expensive than Ola Micro. When you select an Ola Mini, an air-conditioned compact car with seating for up to 3 people will pick you up. This is Ola’s flagship taxi service. Ola Prime is aimed at regular city travelers who are looking for a more spacious ride than the Micro or Mini. When you select an Ola Prime, a sedan class car with seating for up to 4 people will pick you up. OlaFareFinder is not affiliated with Ola®. If you have any questions, please contact us.